Wally Moon's soaring drives over the Los Angeles Coliseum's left field fence were affectionately nicknamed "Moon Shots" for the way he lofted balls into flight over the screen. Sadly, his final "Moon Shot" touched down Friday February 9th, 2018 when he passed away in Bryan, Texas. He was 87. Revered not only for his famous moniker, but his trademark unibrow, Moon immediately made a splash during his Major League debut with the St. Louis Cardinals in 1954 when he homered during his first at-bat. He continued to sizzle during his rookie campaign, batting .304 with 12 home runs and 76 RBIs, besting Hall of Famers Ernie Banks and Hank Aaron for the National League Rookie of the Year Award. During Moon’s 12-year MLB career, he spent the first five with the St. Louis Cardinals and after an injury played down year in 1958, the Cardinals traded Moon to the Los Angeles Dodgers. Presented with a fresh start and a new environment, a healthy Moon changed his hitting approach to aim for the short Los Angeles Coliseum wall, earning him blasts their aforementioned nickname. 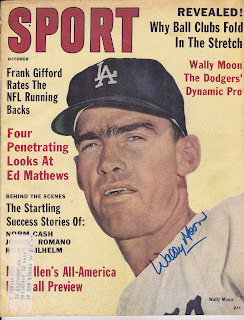 The change of scenery paid off immediately for both Moon and the Dodgers, as he was selected for the 1959 All-Star team and finished fourth in the MVP, both honors coming while helping to lead the Dodgers to World Series victory. He spent the next six seasons with the Dodgers, long enough to claim another World Series ring during the 1965 season, his final major league campaign. The three-time All-Star finished his career with a lifetime .289 batting average with 142 home runs and 661 RBIs. Once away from the major league spotlight, Moon couldn’t stay away from baseball. He spent ten years as the head coach at John Brown University in Arkansas, save for a one year break as the hitting coach with the San Diego Padres in 1969. Moon finally returned to the professional ranks in 1987 when he was given a minor league managing job in the New York Yankees organization. One of the upstarts on his 1988 Prince William club was a fresh-faced 19-year-old Puerto Rican center fielder, Bernie Williams. After the Yankees let Moon go, he settled in with the Baltimore Orioles as a minor league manager and hitting instructor from 1990-1995. In retirement, Moon wrote his autobiography, “Moon Shots: Reflections on a Baseball Life,” in 2010 with Tim Gregg.